Greetings to you from the High Desert. There was frost on a few of the pumpkins and squash this morning. I am glad that plastic was draped over most of them during the night. Although we are carefully preparing for our busy season taking inventory, building stock, installing stoves, and building homes, there are some projects that are with us through the entire year. On the north side of Gallup, we have a community food pantry. In this facility we gather, preserve (and grow), and distribute food 365 days a year. We procure food whereever and whenever possible. It is quite an operation. We have been blessed to obtain a nice freezer space, and refrigeration. The pantry is clean. Volunteers comb through all the food to make sure it is edible. Each item is carefully inspected, and properly placed. We do are very best to provide a balanced parcel of food with all the food groups and real nutrition. This is the reason that we have made the attempt this year to set up a little horticultural section of the pantry where we group fruits and vegetables. This is a real challenge in the high desert with such a short growing season. We are pleased with the first year fruits. Experts in farming have trained some of our people in techniques to maximize our possibility for success. The families that receive this food are those in extreme need. Many times, the hungry will travel great distances, sometimes on foot to make their way to the steps of the food pantry. Sometimes you can recognize the hunger in their eyes. 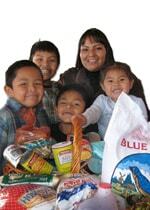 I have enclosed a few photos of children who have benefited from the Community Food Pantry. These photos and the notes they have written are happy pictures after these children have been fed from the stores on the shelves. In looking at these photographs, our hearts are touched with such goodness and innocence. If one of these children was standing on our doorstep asking for a sandwich, there is not one of us that could refuse. This need is just as real for hundreds of our families and so many children. 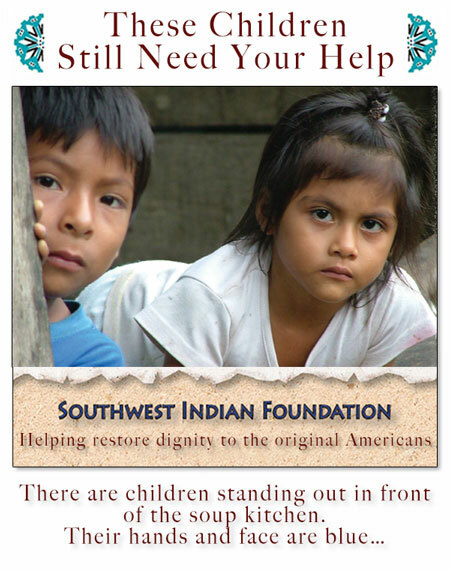 You have been so good and generous to the Southwest Indian Foundation. We are so fortunate to have you to support our work. Please enjoy the Autumn. P.S. This program leaves a lasting legacy in the lives of our unfortunate and forgotten. Won't you please join us? Leave something that will last. Why not do something special this year? Your generous act of charity can lift and carry their spirits throughout the year.